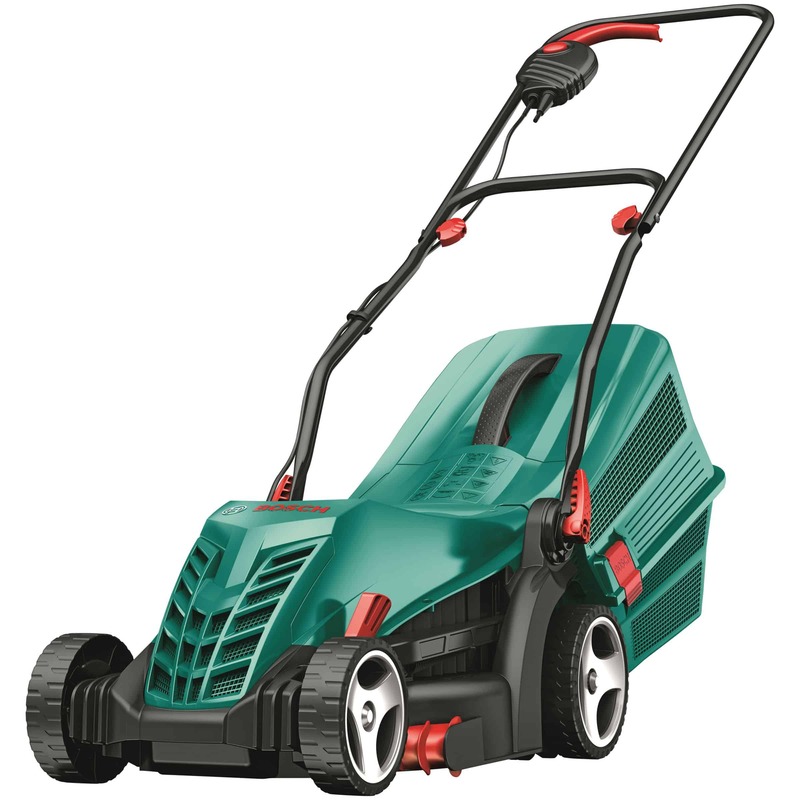 Click here for more information and tips for scarifying your lawn. The Bosch AVR 1100 Verticutter performs similar tasks and jobs to that of its smaller brother the Bosch ALR 900 but with some important differences. 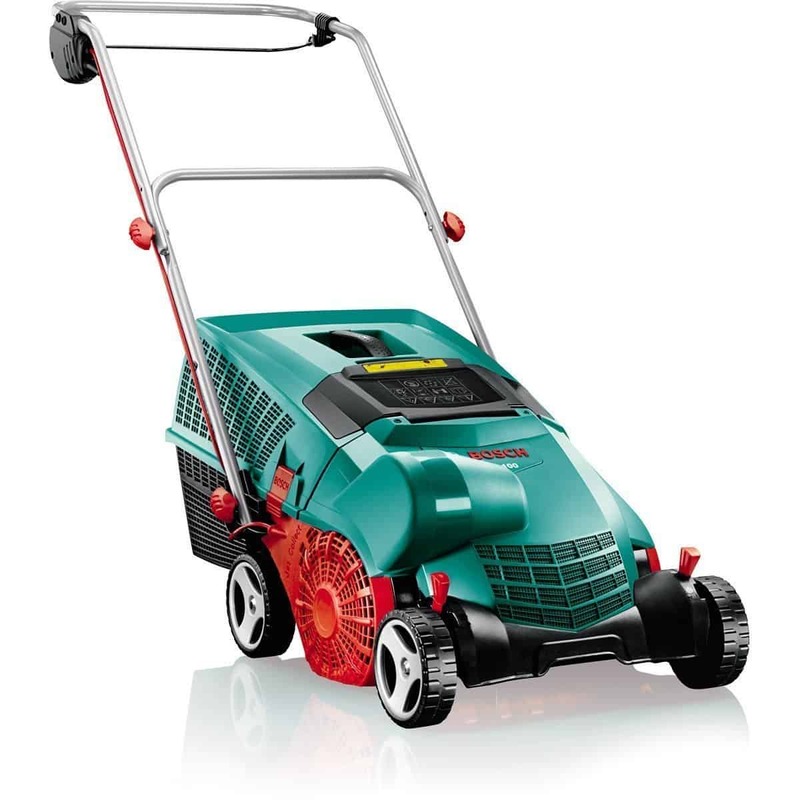 Both are very useful for clearing moss, thatch, leaves and other debris however the Bosch AVR 1100 Verticutter can also be used to give a much more deeper clearing of your lawn because the blades slice through the surface to lift rooted growth and debris. 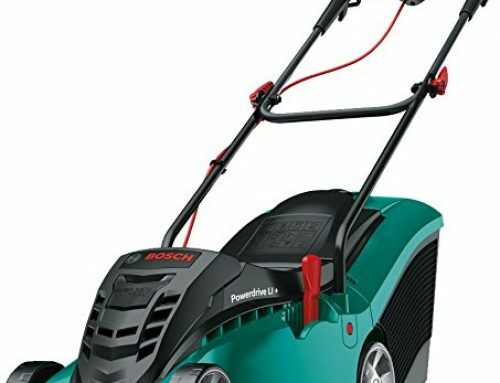 Bosch have also increased the power from 900w to 1100w as the AVR 1100 needs the extra power as it is cutting deeper into the lawn. The ALR 900 has 10 Double Steel Tines where the AVR 1100 has 14 rotating BOR steel blades as shown below. The Bosch AVR 1100 Verticutter is one of the best selling verticutters in the UK, but does it live up to the Bosch reputation for quality and functionality? Well, find out in my review below! After the hottest summer for many years in the UK we are now at that time of year where the lawn mower gets put away and out comes the lawn rake. Below you will learn about all the great (and not so great) features of the Bosch AVR 1100 Verticutter. This verticutter is built in the UK. Why dose this matter? well, customer service, warranty, quality and the availability of spare parts are second to none. When looking at a product of this type, it’s good to compare it to something that claims to be a similar product. I decided to compare it to the Flymo Lawnrake Compact 3400 Electric Lawnrake to understand what makes either of these electric rakes stand out in terms of performance, build quality and value for money. 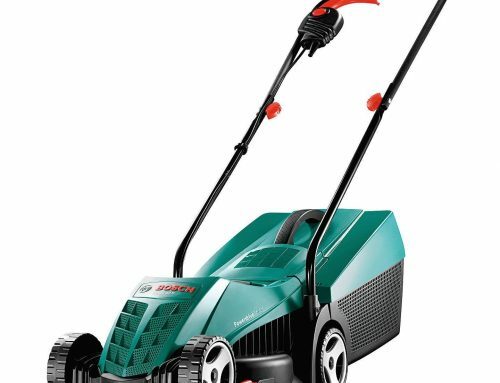 Both the Bosch and Flymo are of a similar price and size (32cm and 34cm rake width), both use a cylinder rake, however, the Bosch has slightly more power at 1100 W compared to 750 W of the Flymo. 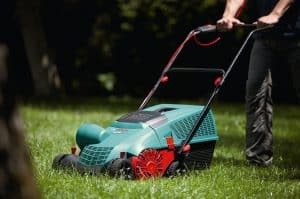 The purpose of a lawn rake is to free your lawn from moss, weeds, thatch and leaves, and I can honestly say that once you have used an electric lawn rake you will wonder how you ever managed without one. Below I’ll be detailing all the features and functions of the Bosch AVR 1100, both good and not so good and then comparing to the Flymo so you understand exactly what you’re getting for your money. The Bosch AVR 1100 comes with a powerful 1100W high-torque ‘Powerdrive’ motor. The PowerDrive system uses an innovative gear set that work together to provide extra torque when needed. 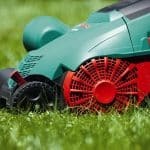 When the lawn is longer or there is thicker moss or thatch the Bosch automatically increases torque to deal with this. 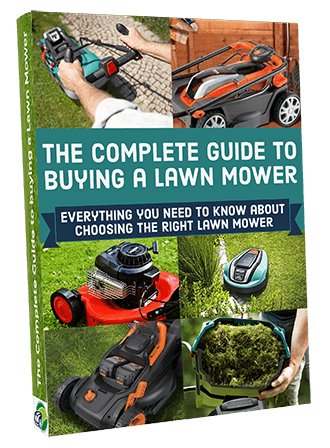 With other lawn rakes you can hear the motor slowing and struggling to deal with the tough lawn or patch and you find yourself having to raise the lawn rake to allow the motor to return to max speed. 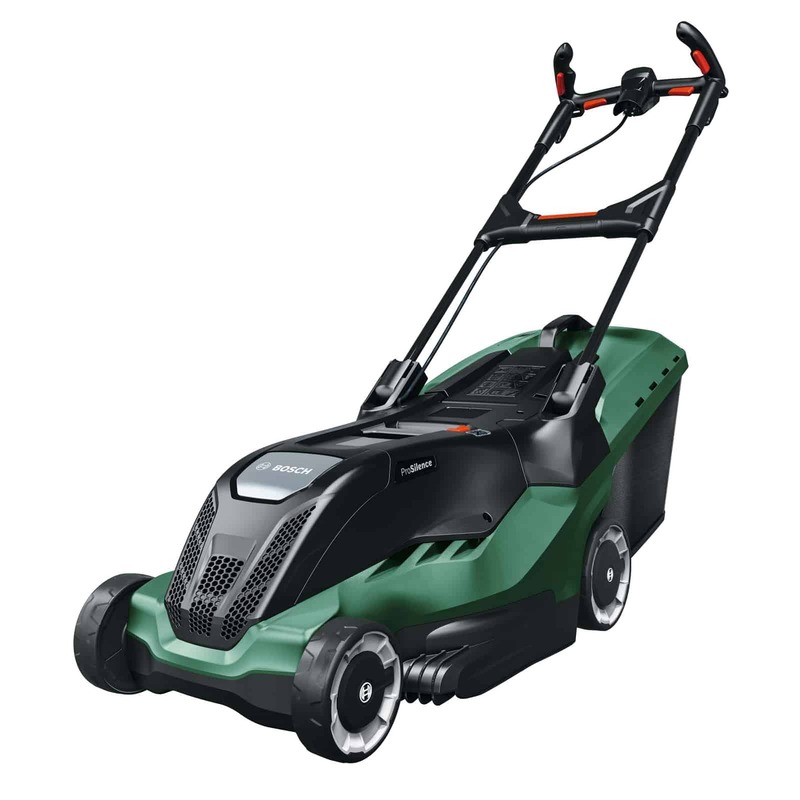 The ‘Powerdrive’ motor is a great feature that is not found on some other lawn rakes in this price range. Also, the power system is completely electric so it produces zero emissions and is one of the more quiet lawn rakes. Which is quieter? well there’s not much between them but I would say the Flymo is slightly quieter than the Flymo. The great thing about a lawn rake is, they take the back breaking work out of scarifying your lawn by hand and getting it looking great in autumn and spring. No more sweat, back ache and blisters, nice! Steel blades generally wear less quickly than plastic blades which results in you needing to replace the tines less often than a rake that uses plastic. 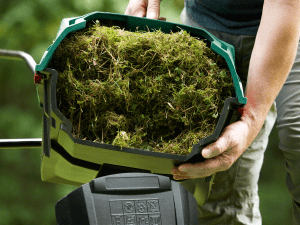 ‘Jet Collect’ system – This is innovative from Bosch, the drum has profiled air inlets that helps to not only make the collection of thatch, moss or leaves more effective but also the addition air flow pressure helps to compact the debris into the drum preventing clogging and increasing the amount collected. This again does put it slightly ahead of the Flymo Lawnrake Compact 3400. Features found on some lawn rakes don’t make the job easier but are “nice to haves”. The Jet Collect system is clearly a feature that makes a real difference to the job in hand, the collection box capacity is increased and the ability to collect the debris is improved – Great job Bosch! As with all lawn rakes the metal blades can be replaced by any competent DIY’er. This is one area where the Flymo performs better than the Bosch. The replacement of the tines on the Flymo Lawnrake Compact is very easy and well designed and are significantly cheaper than that of the Bosch. A set of replacement blades for the Bosch will cost around £27.95 but only £8 for the Flymo. Replacement tines can be purchased easily for both the Bosch and Flymo from Amazon or good gardening store. In order to combat the changing season and to continually improve the look of your lawn, you can adjust the height at which the Bosch AVR 1100 rakes at. This is done using the lever located at the front sides of the mower. It lets you choose to rake from anywhere between +10/+5/0/-5 mm with 4 separate raking heights. 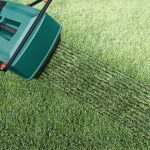 Just make sure you don’t set it at the shortest setting from the start when the lawn has significant growth, instead start at a much higher setting and gradually work your way down. This will help prevent scalping of your lawn. Normally I would complain that levers mounted on the front wheels of a lawn rake are always more difficult to adjust than those mounted more centrally, however the design of the height adjustment lever on the Bosch seems to work very well. Bosch have managed to mount the lever out of the way in the front but still allow for the height to be adjusted easily, very nice! Now, I feel that compared to the Flymo, the height adjustment on the Bosch is slightly inferior. The Flymo has 6 height adjustments (compared to only 4 on the Bosch) and there is a single height adjustment lever on the back wheels of the Flymo. This may sound trivial but something that’s worth a mention. The raking diameter of this lawn rake may seem a little on the small side with only a 32cm capability, that is 2cm smaller than its rival the Flymo. Now, compared to it’s other counterparts with widths of up to 43cm, this might be a potential disadvantage; however, it could also be beneficial if it’s to be used in a smaller areas and lawns with more narrow strips. When you need a lawn rake that’s light in weight and going to get in the smaller areas of your lawn, this may well be the best option. Yes, it will take longer to rake the entire area, but if it fits, and hey there’s no rush then the Bosch AVR 1100 could be the electric lawn rake of choice. Remember this rake has a large 50 litre collection box so less stops to empty helps to get the job done quicker. 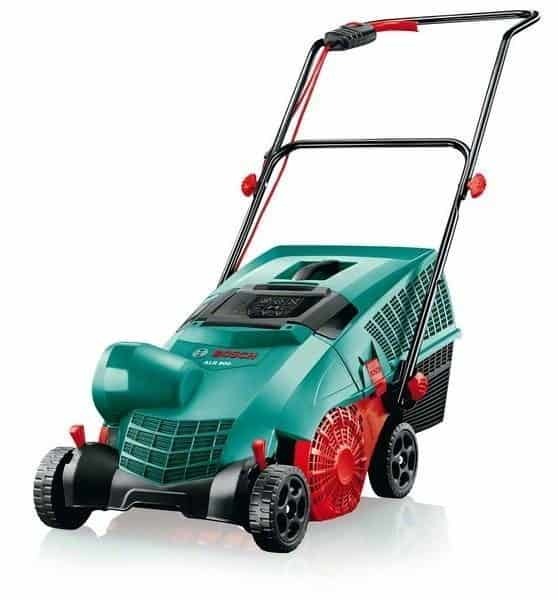 The Bosch AVR 1100 has a very impressive 50 litre grass box, now this may not sound large, but when compared the Flymo at just 34 litres you will see this is large for a lawn rake of this size. The collection box on the Bosch attaches to the rear of the rake (like a lawn mower), this is the reason Bosch can achieve such a large collection box. The Flymo’s collection box is more integral to the rake, reducing the capacity. The advantage for the Flymo is smaller overall dimensions and the disadvantage is the relatively small collection storage. Both rakes really are comparable when it comes to collection efficiency. Both collect the raked debris very well and its hard to see if one is better than the other. Also, they both compact the debris very well and you’ll be surprised just how much can be squashed into the collection box before the need to empty. The ‘Jet Collect’ system on the Bosch does seem to, perhaps, just make it the slight winner when it comes to collection of wet leaves on the lawn for example. The flow of air produced by this system seems to help prevent clogging of the collection box inlet and slightly improves compaction. The grass box on the Bosch AVR 1100 does seem to be a little flimsy which is surprising for Bosch, having said that it does not seem to affect the performance in any way. I believe the collection box feels a little flimsy as it comes in two parts. Bosch have done this to reduce the storage space required for the collection box as it can be split into two sides when not in use. There is no level indicator or vision window on the Bosch AVR 1100 so it can be little difficult to know when the collection box is full. The Flymo Lawnrake Compact 3400 does have a collection box window, this is a nice touch – well done Flymo. Now, overall does the above make the Bosch better than the Flymo? Yes, not only the Flymo but almost all the lawn rakes we have tested. The Bosch AVR 1100 will not disappoint when it comes to collection and emptying of the collected debris. Now here’s the thing! 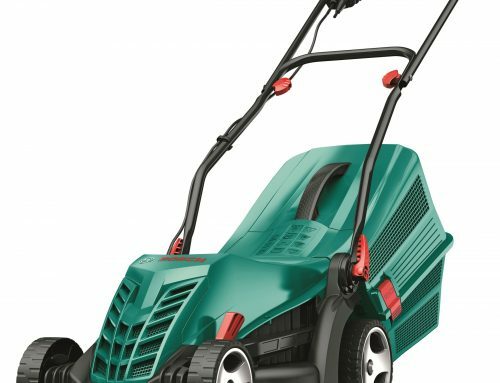 Is the Bosch AVR 1100 a practical lawn rake? We know it performs extremely well getting the job done, but what about practicalities? The light weight (10kg), small size and fold away handles make this lawn rake excellent for smaller lawns or lawns with smaller strips of grass. 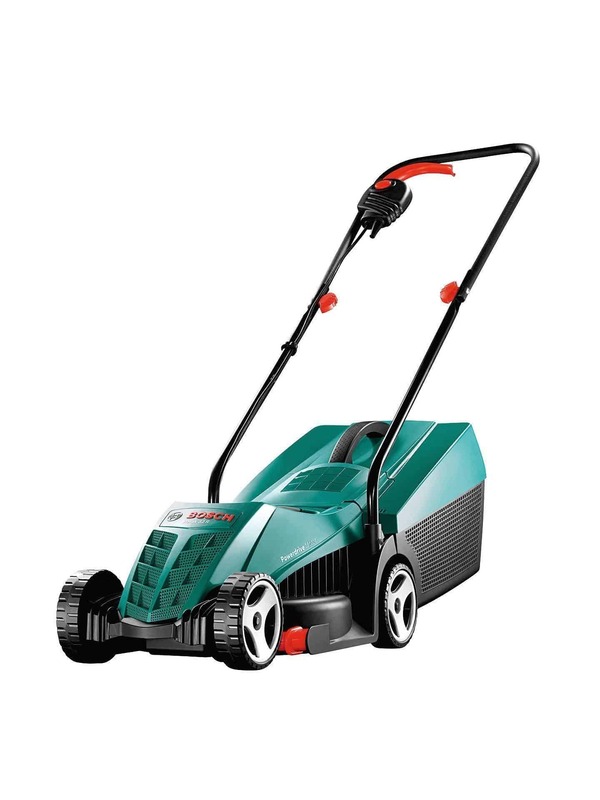 The 32 cm width seems to be just right when you need to navigate lawns with flower beds or narrow strips, however, if I had a very large open lawn I would consider a lawn rake with a larger width. 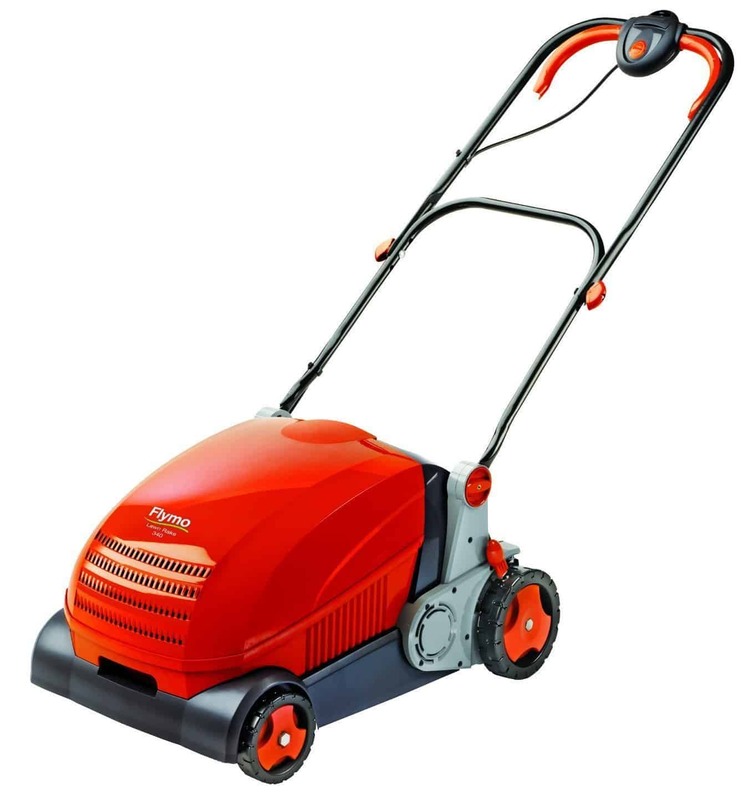 The compact size really will make lawn care much easier and really makes the entire experience much less dependent on you struggling with a heavy over sized lawn rake. Is it smaller and lighter than the Flymo? well, smaller yes, but roughly the same weight. The integrated collection box does make the Flymo smaller for storage but the comprise is the smaller collection box and the need to empty more often. Bosch have tried to compensate for the larger box by making the collection box dismantle into two pieces for smaller storage. Does this make it more practical than it’s closest competition? well, yes I think it does for people with smaller lawns and limited space for storage with the ability to get the job done without emptying the collection box as often. There is also a very handy and well positioned central handle that makes carrying the 10 kg rake to the garage or shed very easy. The Bosch AVR 1100 also comes with a 2 year manufactures guarantee. Most lawn rakes will only provide the dual button lever method of starting the device. This is to prevent the rake being started accidentally or by children. There is no additional safety feature such a removable safety keys as found on some lawn mowers. This lawn rake can be a little tricky to assemble first time. It is only the handles that need assembling and once done all is good. Only 4 height settings. This is a shame as most of the Bosch’s competitors have at least 6 height settings. The handles once assembled can seem a little flimsy and insecure. Bosch have gone someway to resolving this by providing longer bolts to connect the handles. Single lever start stop handle. The Flymo has dual left right start stop handles. Now the above may sound trivial and are common to most lawn rakes but should be taken into consideration anyway. They are part of the package and it’s better being aware of them before a purchase than after. 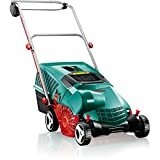 Overall this is an excellent electric lawn rake and verticutter, due to it’s light weight, portability, good build quality and array of features. I really struggled to find any major downsides, it even comes with a 2 year warranty if you register the rake with Bosch. 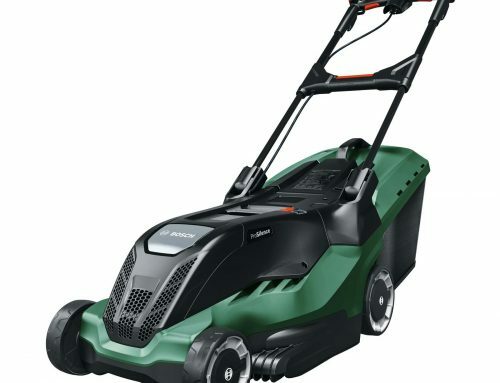 The extra features like the Bosch Powerdrive and the ‘Jet Collect’ system are not just nice to have features but features that improve the performance of the lawn rake and make that job that little bit easier, besides you want features that will help achieve a lovely looking lawn with least amount of work and effort. 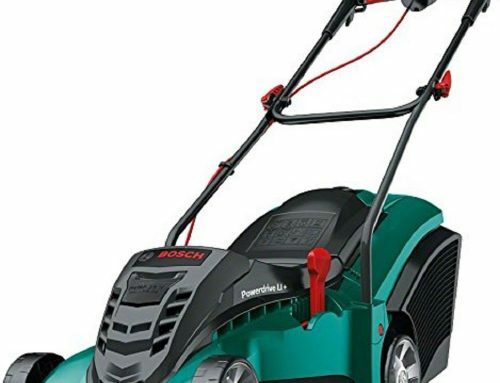 The Bosch AVR Electric Lawn verticutter is very proficient at raking and scarifying varying lengths and thickness for such a small and compact verticutter, the only sight disadvantage is you only have 4 different height settings. 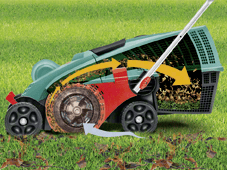 It’s worth mentioning that by raking on a higher setting to start and trying to avoiding very long or wet grass this should avoid not putting too much strain on the motor. 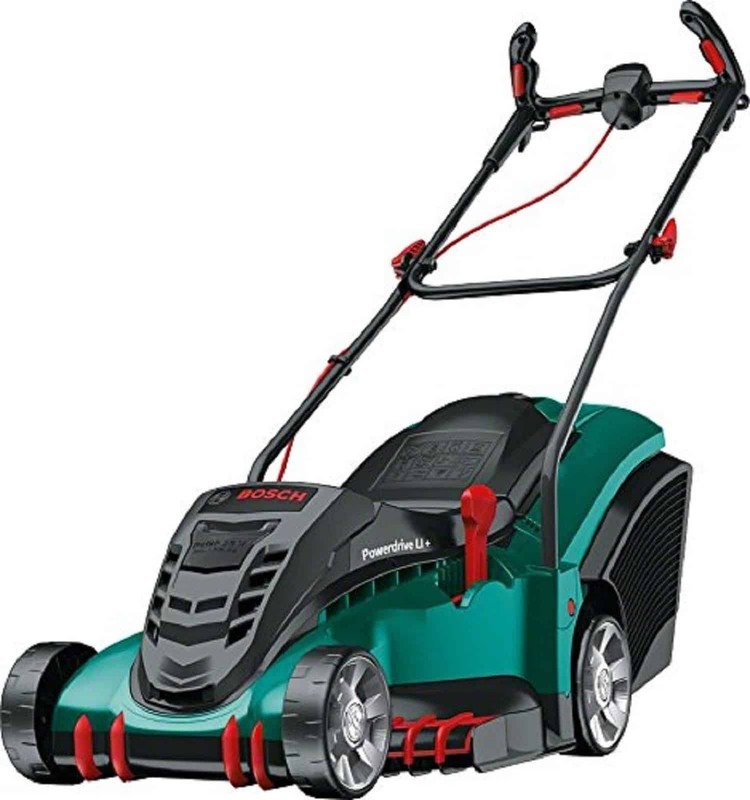 With this lawn rake you’re getting features normally found in high priced models, this is not the cheapest but is a very reasonable priced for what you are getting. 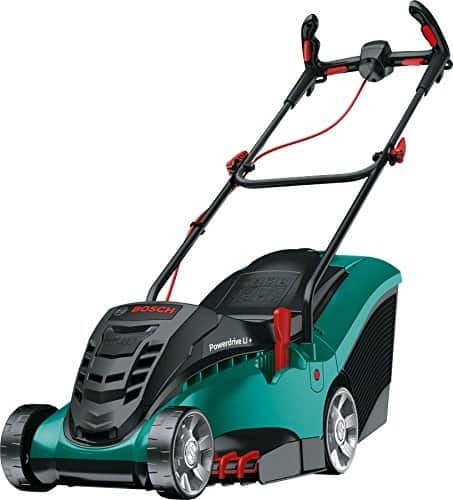 At this price range this really gives great value for money and you would be very hard pressed to find an electric lawn rake that performs this well, and has such a good build quality for this price. 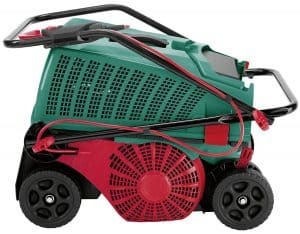 Overall I think this is a fantastic lawn rake and I encourage everyone who wants to take care of their lawn and wants to make light work of scarifying your lawn to purchase one. In fact I think it’s the best lawn rake at this level you can get right now! Like the convenience of having a rake that can be used for moss, thatch, weeds and leaves. The Bosch AVR 1100 Verticutte can be purchased from Amazon. Amazon have very competitive prices and fast delivery. If you are an Amazon prime member delivery is free and next day. Click the link below to get the current price and see more reviews. Have you experienced replacing one of the blade holders. Trying to do mine now and cannot remove the end bearing. Is there something I’m missing? No sorry I have not. You could contact Bosch support, they are very helpful. I have included their contact number below.